Bharatiya Janata Party National President Shri Amit Shah released the party manifesto named ‘Lok Kalyan Sankalp Patra’ (Pledge for People’s Welfare) for the upcoming Uttar Pradesh assembly polls 2017 on 28 January, 2017 in Lucknow. 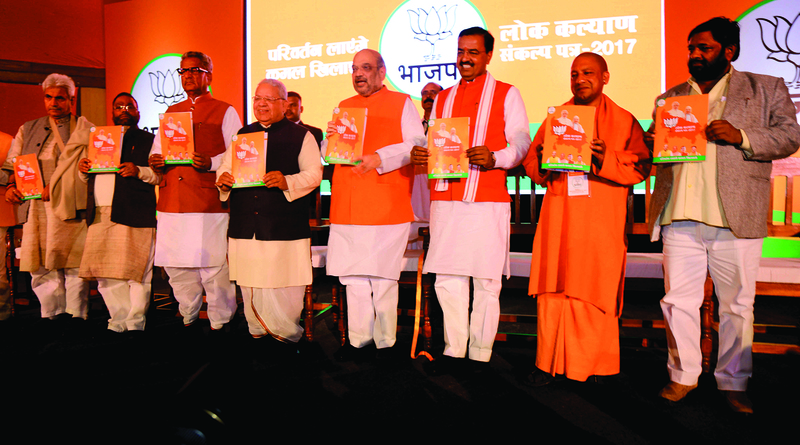 On the occassion Shri Amit Shah was accompanied by other senior leaders like Union Minister Shri Kalraj Mishra, party state Prabhari Shri Om Prakash Mathur, BJP State President Shri Keshav Prasad Maurya, Shri Yogi Adityanath and others while unveiling the document. While releasing the manifesto, Shri Shah said the SP and BSP have ruled Uttar Pradesh but there was no development in the state. This time BJP will form the next government in the State with two third majority, he said. He accused the Samajwadi Party (SP) and the Bahujan Samaj Party (BSP) for plundering the state for 15 years and said the BJP has come with a pledge to transform the state. He said the Central government had sanctioned Rs1 lakh crore to Utter Pradesh but no development was seen on ground, law and order was at its nadir. He added that Akhilesh Yadav would have to answer for problems faced by state where ruling party Goondas have grabbed land. The BJP President promised to waive off the agricultural loans, free education up to Class XII and 24 hours power supply if the party voted to power in the upcoming assembly polls. He said a BJP government in UP would press for an early solution to the Ram Janma Bhumi temple tangle within the ambit of the constitution. The manifesto has been divided into 9 key segments and mainly focused on the issue of law and order and overall development of the state. With a segment titled ‘Gunda Mukt Uttar Pradesh-Bhrashtachar Mukt Uttar Pradesh’, the manifesto, also targets the corruption that has been prevailing in the state under the Samajwadi Party rule. Other key issues that the party has promised to tackle and deliver results include better education, schemes for girl child, health and employment generation for the youth. BJP promises to increase strength of the police force to 1 lakh in the State and it will ensure that the communal clashes that happen in the state will reduce and set up a separate force to deal with the issue. The party also promised to raise anti-Romeo police battalions to tackle crimes against women. All appointments to grade 3 and grade 4 jobs will not entail an interview version promises manifesto. It promises to give free laptops with ‘Sabka Saath Sabka Vikas‘tag, to all college students with one 1 GB free internet a month. There will also be the setting up of more than 10 international standard universities in the state with free Wi-Fi in all campuses. The party will also set up the Madan Mohan Malviya Sanskrit University. A ‘Gareeb Kalyan’ card will be given to the poor with a guarantee of availability of Rs 6 lakh for constructing cemented houses. BJP promises to waive off loans for small farmers of the state. The BJP also promises to ensure 100 percent electrification in the state under the ‘Ujwala Yojana’. It promises for the provision of LPG gas and toilets to every house and ensure that every village has access to a bank. BJP to set up Metro Services and helicopter services via Pawan Hans helicopters in all major cities of the state. BJP will set up six IT parks in the state. The party will work to enhance the security and development of women. The BJP will set up six new AIIMS hospitals in the state. Ram Janma Bhoomi construction will be ensured as per constitutional means. The manifesto said the party will take the opinion of Muslim women over the Islamic divorce practice of Triple Talaq. Promises to close down illegal slaughter houses in the state.